In only four years, you'll have more hands-on experience than a pre-vet major — taking x-rays, assisting in surgeries. With a bachelor's degree in animal health science, you can become a veterinary technologist, working side-by-side with veterinarians. Customize your major to go into private practice, research, public health or business administration. We have been accredited by the American Veterinary Medical Association's Committee on Veterinary Technician Education and Activities since 1997. Our students are eligible to take the Veterinary Technician National Exam (VTNE) and become licensed as a registered veterinary technologist (RVTg). Cal Poly Pomona graduates who take the VTNE for the first time have a three-year average pass rate of 91 percent; in contrast, the national average is about 70 percent, based on a July 1 to June 30 reporting year (2015-2018). More info. On the farm and in the hospital. Learn hands-on with small animals and the farm animals on our 1,500-acre campus and at off-campus externships. 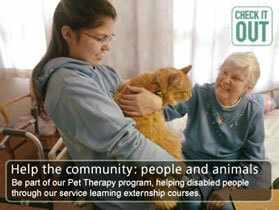 Get certified as a registered veterinary technologist in only 4 years. Keep animals healthy and happy by performing dental exams and administering vaccines. Study animal nutrition and develop feeding programs for different lifecycle stages. 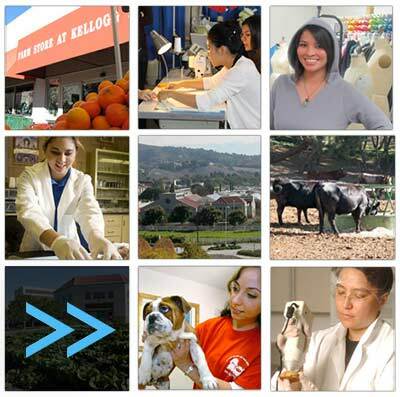 Take courses that take you where you want to go — from the pet food industry to becoming a specialist. Focus on business, research, nutrition, anesthesiology, dentistry, emergency and critical care.